Global Communities was originally established as the Foundation for Cooperative Housing (FCH) in 1952, a 501c(3) non-profit corporation seeking to help low- and moderate- income families in rural America and low-income urban neighborhoods to achieve improved economic standing and quality of life through the construction of affordable housing. Following our inception, we sponsored over 60,000 units of cooperative housing in 35 states across the US. In 1962, our strong record of accomplishment within the U.S. caught the attention of the United States Agency for International Development (USAID), a government funding agency that invited us to apply our experience on an international level. Our first overseas programs were focused on housing microfinance in Central America. 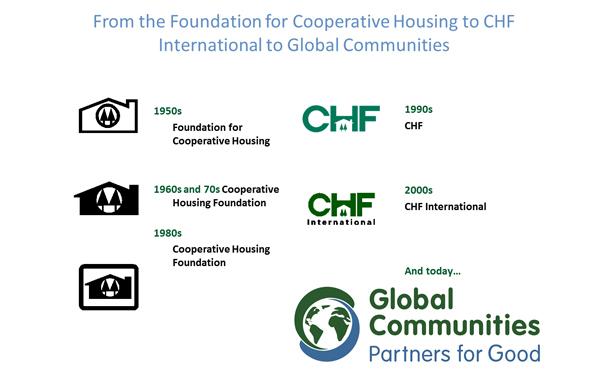 Our name at this time was the Cooperative Housing Foundation (CHF). Since the 1960s, CHF focused increasingly on international issues. With experience, it quickly became clear that addressing one linear area of development alone was not producing outcomes that were sustainable for the long-term. A program that demands community investment in housing but turns a blind eye to the need for income generation to maintain those structures is doomed to fail. As a result, our programming has expanded; in addition to housing microfinance we now address concerns in the areas of humanitarian assistance, economic development, infrastructure & construction, governance & urban management, civil society & capacity development, food security & agriculture and youth & gender. In 1998, we began to refer to ourselves as CHF International to reflect our overseas focus. As the field of development and the communities that we work with evolve, we evolve with them and continue to expand programming and adapt our methods to better affect meaningful change within those communities. In 2012 – the year marking our 60th anniversary – we changed our name to Global Communities to better reflect our approach to developing communities worldwide. Our new slogan “Partners for Good” reflects the central principle of our organization: creating enduring partnerships with communities, the private sector, government and other organizations to foment positive change in the lives of the vulnerable.